We are excited to announce The Walker Fund, the school's new approach to annual giving! Like the Annual Fund before it, the newly revamped Walker Fund provides critical support, beyond tuition dollars, to meet the needs of our students and faculty today. However, through the new Family of Funds, donors can now designate their gift to the area of the school's operating budget that is most meaningful to them. 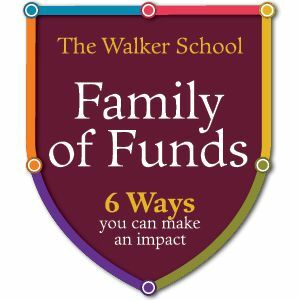 These six funds represent the core strengths of a Walker education. Academic Programs – Our teachers combine a rigorous college-preparatory curriculum with an inquiry-based approach to learning in all subjects. This fund provides teachers with the innovative classroom resources, technology support, curriculum and co-curricular programs designed to inspire and challenge every type of learner. Faculty Support – Our faculty are the heart of Walker. Gifts to this fund provide support for our faculty, which includes opportunities for professional development, so they can bring new ideas to their classrooms. Athletics – Walker athletics are a big source of Wolverine Pride. Gifts to this fund provide for coaching support, equipment, uniforms, field maintenance and also support physical education programs for Primary, Lower and Middle School. Fine & Performing Arts – The arts are an essential part of a Walker education. Gifts designated to this fund support all of the arts at Walker – from theater to band, from chorus to 2D and 3D visual arts. Financial Aid – This fund supports financial assistance for students whose families demonstrate need. This allows Walker to enroll talented and motivated students whose contributions enrich Walker’s unique community. *The Family of Funds supports the faculty and students through the school’s operating budget. Should directed contributions exceed a fund’s budgeted limit, the school’s administration reserves the option to direct the use of such contributions to the area of greatest need. How much of a difference can my gift make, really? The Walker School has fewer supporters than a large university or charity. But our needs are just as great, so every gift counts more. That’s why we ask every member of the Walker community – including our Board of Trustees, parents, faculty and staff, alumni, grandparents, parents of alumni, and friends – to make a yearly gift to the Annual Fund. The culture of philanthropy at Walker - both past and present - allows your child to benefit from an engaging educational experience within an intimately scaled, caring and diverse community where opportunities abound and meaningful relationships inspire transformative learning. How much should my family contribute? We ask that everyone in our Walker community give at the level that is right for their family. Gifts at all levels - from the Leadership Society to the Supporter Level - are greatly valued and deeply appreciated. My family already pays tuition. Why is a gift to the Walker Annual Fund needed as well? It is a reality not just at Walker but at all independent schools: tuition alone cannot fund the entire cost of a private education. Because tuition only covers 95% of the school's operating costs, Walker is dependent upon unrestricted Annual Fund contributions to help close the gap between tuition and the true cost of a Walker education each year. Your voluntary, tax-deductible support helps Walker address its highest priorities and immediate needs within the current school year's operating budget. You stress the need for a high level of participation in the Walker Annual Fund, especially among parents. Why is this so critical? High participation rates among members of the Walker community are a vote of confidence - a sign that our parents and others invest in our students' future and support the school’s mission. This percentage has a direct impact on gifts from outside sources such as grant-making foundations. High rates of participation are required by foundations before they will consider our grant requests. Walker's participation rates have been instrumental in helping the school secure nearly $3 million in grant funds in recent years. How does the Walker Annual Fund benefit my child and my family? Every dollar contributed to the Walker Annual Fund is used to provide for the outstanding faculty, programs and facilities that directly benefit your student every day. Ensure that faculty salaries remain competitive so that we can retain the finest teachers, coaches and staff. They also work to provide professional development opportunities so that faculty and staff gain new knowledge and skills in their area of expertise. Integrate state-of-the-art technology and new curriculum materials into our classrooms and libraries. Provide the resources needed to sustain and enhance our high quality academic, arts and athletic programs.